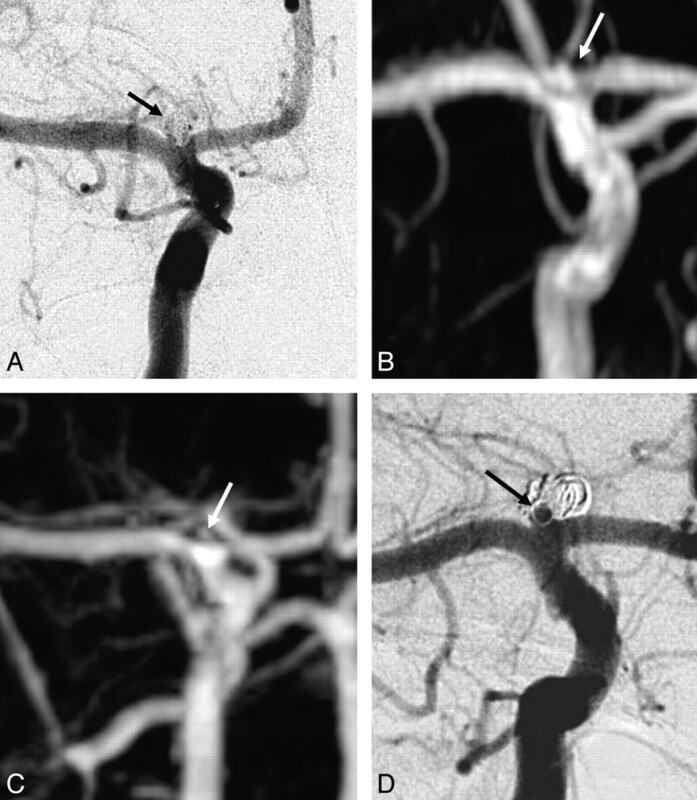 BACKGROUND AND PURPOSE: MR angiography (MRA) is increasingly used as a noninvasive imaging technique for the follow-up of coiled intracranial aneurysms. However, the need for contrast enhancement has not yet been elucidated. We compared 3D time-of-flight MRA (TOF-MRA) and contrast-enhanced MRA (CE-MRA) at 3T with catheter angiography. MATERIALS AND METHODS: Sixty-seven patients with 72 aneurysms underwent TOF-MRA, CE-MRA, and catheter-angiography 6 months after coiling. Occlusion status on MRA was classified as adequate (complete and neck remnant) or incomplete by 2 independent observers. For TOF-MRA and CE-MRA, interobserver agreement, intermodality agreement, and correlation with angiography were assessed by κ statistics. RESULTS: Catheter-angiography revealed incomplete occlusion in 12 (17%) of the 69 aneurysms; 3 aneurysms were excluded due to MR imaging artifacts. Interobserver agreement was good for CE-MRA (κ = 0.77; 95% confidence interval [CI], 0.55–0.98) and very good for TOF-MRA (κ = 0.89; 95% CI, 0.75–1.00). Correlation of TOF-MRA and CE-MRA with angiography was good. The sensitivity of TOF-MRA and CE-MRA was 75% (95% CI, 43%–95%); the specificity of TOF-MRA was 98% (95% CI, 91%–100%) and of CE-MRA, 97% (95% CI, 88%–100%). All 5 incompletely occluded aneurysms, which were additionally treated, were correctly identified with both MRA techniques. Areas under the receiver operating characteristic curve for TOF-MRA and CE-MRA were 0.90 (95% CI, 0.79–1.00) and 0.91 (95% CI, 0.79–1.00). Intermodality agreement between TOF-MRA and CE-MRA was very good (κ = 0.83; 95% CI, 0.65–1.00), with full agreement in 66 (96%) of the 69 aneurysms. CONCLUSIONS: In this study, TOF-MRA and CE-MRA at 3T were equivalent in evaluating the occlusion status of intracranial aneurysms after coiling. Because TOF-MRA does not involve contrast administration, this method is preferred over CE-MRA. MR angiography (MRA) has been used as an alternative noninvasive imaging technique to assess the occlusion of coiled intracranial aneurysms with promising, but not yet conclusive, results.8–22 MRA can be performed without contrast enhancement with 3D time-of-flight (TOF-MRA) or with contrast enhancement (CE-MRA). Contrast administration has several disadvantages, such as patient discomfort, risk of renal damage,23 risk of allergic reaction, and higher cost. From published data, it is unclear which of the 2 MRA techniques, if any, provides the better diagnostic accuracy. To our knowledge, no studies are available that directly compare TOF-MRA and CE-MRA at 3T with angiography as a reference standard in the detection of reopening of coiled aneurysms. The purpose of our study was to compare the diagnostic performance of TOF-MRA and CE-MRA at 3T with catheter angiography as a reference, at 6-month follow-up of coiled intracranial aneurysms. The study was approved by the institutional review board. Written informed consent was obtained from all patients. Between May 2005 and November 2007, all patients with coiled intracranial aneurysms scheduled for 6-month follow-up angiography were selected to participate in this study. Patients were requested to undergo TOF-MRA and CE-MRA at 3T on the same day as their standard follow-up angiography. Patients were not considered eligible when they were younger than 18 years of age, when additional aneurysms were treated with neurosurgical clips, when they had claustrophobia, or when a pacemaker was implanted. Complications of catheter angiography and CE-MRA were recorded. Follow-up angiography was performed on a single-plane angiographic unit (Integris Allura Neuro; Philips Medical Systems, Best, the Netherlands). Six to 8 mL of nonionic contrast material (iodixanol, Visipaque 320 mg I/mL; Amersham Health, Cork, Ireland) was injected into the internal carotid or vertebral artery with a power injector at 4–6 mL/s. Three views were acquired in each patient, including the working projection of the endovascular treatment. 3D rotational angiography was usually not performed at follow-up. MR imaging examinations were performed on a 3T system (Intera R10; Philips Medical Systems) by using the sensitivity encoding (SENSE) 8-channel phased-array head coil. The protocol included transversal T1-weighted spin-echo and T2-weighted fast spin-echo sequences, phase contrast survey MRA as a preparation for MRA, 3D TOF-MRA with multiple overlapping thin slab acquisition (MOTSA), and CE-MRA sequences. Imaging parameters for the T1-weighted spin-echo sequence were TR/TE, 500/10 ms; 256 × 205 matrix (reconstructed to 512 × 410); FOV, 230 × 184 mm (ie, 80% rectangular FOV); and 4-mm section thickness with a 1-mm gap. Parameters for the T2-weighted fast spin-echo sequence were TR/TE, 3000/80 ms; 400 × 320 matrix (reconstructed to 512 × 410); FOV, 230 × 184 mm (ie, 80% rectangular FOV); 4-mm section thickness with a 1-mm gap and a turbo spin-echo factor of 15. For MRA, gradient-echo techniques were used. TOF images were acquired in the transverse plane with the following parameters: TR/TE, 20/4 ms (shortest); flip angle, 20°; 512 × 328 matrix (reconstructed to 1024 × 870); FOV, 200 × 170 mm (ie, 85% rectangular FOV); 1.0-mm thick sections interpolated to 0.5 mm; 220 sections acquired in 10 chunks, resulting in a coverage area of 110 mm. The measured voxel size of the TOF-MRA image was 0.39 × 0.61 × 1 mm, and the reconstructed voxel size was 0.2 × 0.2 × 0.5 mm. The scanning time of MOTSA 3D TOF sequences was reduced by using SENSE. We used a SENSE reduction factor of 1.5, which resulted in an acquisition time of 7 minutes. The timing for the 3D CE-MRA was calculated from the time-to- peak of a dynamic 2D (0.9-second cycle time) gradient-echo sequence with a midsagittal section of 50-mm thickness following injection of 1 mL of gadopentetate dimeglumine (Magnevist; Bayer Health Care Pharmaceuticals, Montville, NJ) intravenously. Subsequently, 15 mL of gadopentetate dimeglumine was injected at a rate of 2 mL/s for acquisition of 3D CE-MRA. Imaging parameters were as follows: TR/TE, 5.3/1.7 ms (shortest); flip angle, 30°; FOV, 250 × 200 mm (ie, 80% rectangular FOV); 368 × 263 matrix (reconstructed to 512 × 410); 1.0-mm-thick sections interpolated to 0.5 mm. The measured voxel size of the 3D CE-MRA image was 0.68 × 0.76 × 1.00 mm, and the reconstructed voxel size was 0.49 × 0.49 × 0.50 mm. SENSE was also used in 3D CE-MRA imaging with a SENSE reduction factor of 2 and a resulting scanning duration of 36 seconds. Also the randomly sampled central k-space technique was applied here. Total scanning duration was 20 minutes. Adverse events during MRA were registered. Aneurysm occlusion status on 6-month follow-up angiography was assessed by an experienced interventional neuroradiologist (W.J.v.R. ), who was blinded to parallel MRA results. The occlusion status of the coiled aneurysms on TOF- and CE-MRA was classified both in a 3-tier scale as complete occlusion, neck remnant, and incomplete occlusion and in a 2-tier scale as adequate occlusion (complete occlusion and neck remnant) and incomplete occlusion. All TOF-MRA and CE-MRA images were evaluated independently and in random order by 2 experienced interventional neuroradiologists (R.v.d.B. and M.E.S.S. ), who were unaware of the parallel angiography results. Source images, 3D maximum-intensity projections, and 3D volume-rendered reconstructions were available on a 3D Vitrea workstation (Vital Images, Minnetonka, Minn). 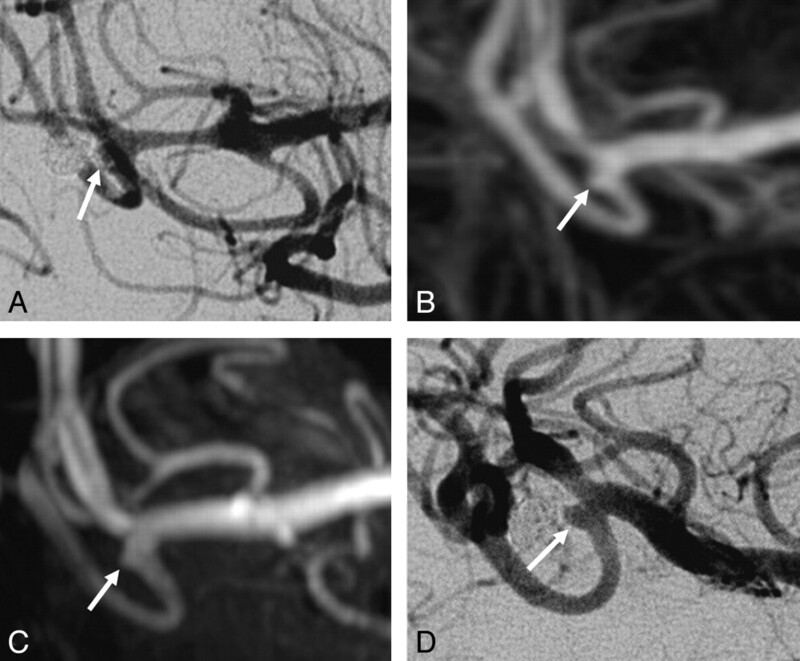 Occlusion status of the coiled aneurysms was classified in the same way as for angiography. Discordant results in TOF-MRA images between the observers after completion of the evaluation were jointly reassessed in a second reading session to reach a consensus; a similar procedure was followed for the CE-MRA images. Test characteristics of TOF-MRA and CE-MRA with corresponding 95% confidence intervals (CI) were calculated for the 2-tier occlusion scale. This was done because only the classification of incomplete occlusion is important in clinical decision making in terms of considering additional treatment. We compared the areas under the receiver operating characteristic curve (AUROC) for TOF-MRA and CE-MRA. Sixty-seven patients (46 women, 21 men; mean age, 49 ± 12 years) with 72 coiled aneurysms agreed to participate in the study. Of 72 coiled aneurysms, 60 were ruptured. Mean aneurysm size was 7 ± 5 mm. Twenty-nine aneurysms were located on the carotid artery; 28, on the anterior cerebral artery; 8, on the middle cerebral artery; and 7, in the posterior circulation. 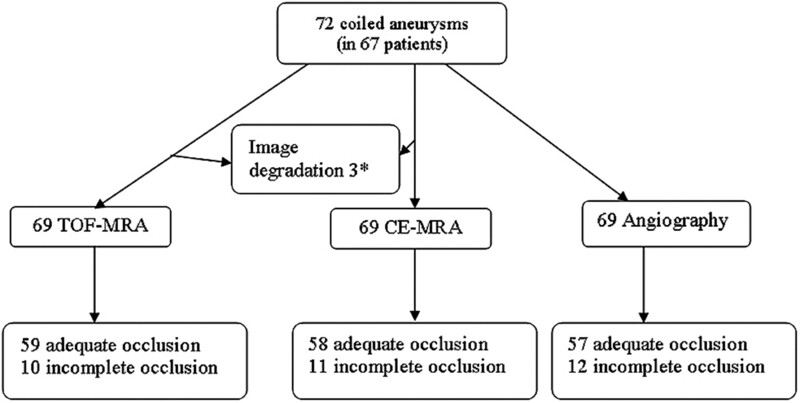 On CE-MRA, 3 aneurysms could not be assessed due to coil artifacts and venous overlap and were excluded, leaving 69 aneurysms evaluated with CE-MRA. On TOF-MRA, 1 aneurysm could not be assessed due to coil artifacts; this aneurysm showed similar coil artifacts on CE-MRA and had already been excluded, leaving 71 aneurysms evaluated with TOF-MRA. As a result, 69 similar aneurysms in 64 patients were used for the analyses of intermodality agreement and correlation between the imaging techniques (Fig 1). There were no complications, either from angiography or MRA. Flow chart of all coiled aneurysms at 6-month follow-up. *Three aneurysms were excluded due to coil artifacts and venous overprojection on CE-MRA. One of these aneurysms was also excluded due to coil artifacts on TOF-MRA. On 6-month follow-up angiography, 57 coiled aneurysms were adequately occluded and 12 aneurysms were incompletely occluded (Fig 1). Of the 12 incompletely occluded aneurysms, 5 were additionally treated. Interobserver agreement for TOF-MRA for the 3-tier classification was good (κ = 0.74; 95% CI, 0.60–0.88), with full agreement in 58 (82%) of the 71 aneurysms that could be evaluated. For the 2-tier classification, interobserver agreement was very good (κ = 0.89; 95% CI, 0.75–1.00), with full agreement in 69 (97%) of 71 aneurysms. Interobserver agreement for CE-MRA for the 3-tier classification was good (κ = 0.67; 95% CI, 0.51–0.82), with full agreement in 53 (77%) of 69 aneurysms. For the 2-tier classification, interobserver agreement was also good (κ = 0.77; 95% CI, 0.55–0.98), with full agreement in 65 (94%) of 69 aneurysms. Correlation between TOF-MRA and angiography for the 3-tier classification was moderate (κ = 0.57; 95% CI, 0.40–0.74), with full agreement in 47 (68%) of 69 aneurysms. For the 2-tier classification, the correlation between TOF-MRA and angiography was good (κ = 0.78; 95% CI, 0.58–0.99), with full agreement in 65 (94%) of 69 aneurysms (Table 1). TOF-MRA wrongly classified 3 of the 12 incompletely occluded aneurysms as adequately occluded: a ruptured 4-mm carotid tip aneurysm (Fig 2), a ruptured 4-mm middle cerebral artery aneurysm (Fig 3), and a ruptured 7-mm carotid artery aneurysm (Fig 4). In none of these 3 aneurysms was additional treatment indicated. All 5 incompletely occluded aneurysms that were additionally treated were correctly identified with TOF-MRA as incompletely occluded (Fig 5). One ruptured 6-mm basilar tip aneurysm that was completely occluded on angiography was incorrectly classified by TOF-MRA as incompletely occluded. The sensitivity of TOF-MRA was 75% (95% CI, 43%–95%); the specificity was 98% (95% CI, 91%–100%). All test characteristics of TOF-MRA and AUROC are displayed in Table 2. Disagreement between both TOF-MRA and CE-MRA with angiography on the occlusion of a carotid tip aneurysm. A, Angiogram obtained immediately after coiling shows adequate occlusion with a small neck remnant (arrow). B, Follow-up TOF-MRA at 6 months shows complete occlusion (arrow). C, Follow-up CE-MRA at 6 months shows a small neck remnant (arrow). D, Follow-up angiogram at 6 months shows incomplete occlusion (arrow). Because the geometry of the reopened aneurysm was unfavorable, this patient was not retreated but subjected to extended follow-up. Disagreement between both TOF-MRA and CE-MRA with angiography on the occlusion of a middle cerebral artery aneurysm. A, Angiogram obtained immediately after coiling shows a small neck remnant (arrow). B, Follow-up TOF-MRA at 6 months shows a small neck remnant (arrow). C, Follow-up CE-MRA at 6 months shows a small neck remnant (arrow). D, Follow-up angiogram shows incomplete occlusion (arrow). Because the geometry of the reopened aneurysm was unfavorable, this patient was not retreated but was subjected to extended follow-up. 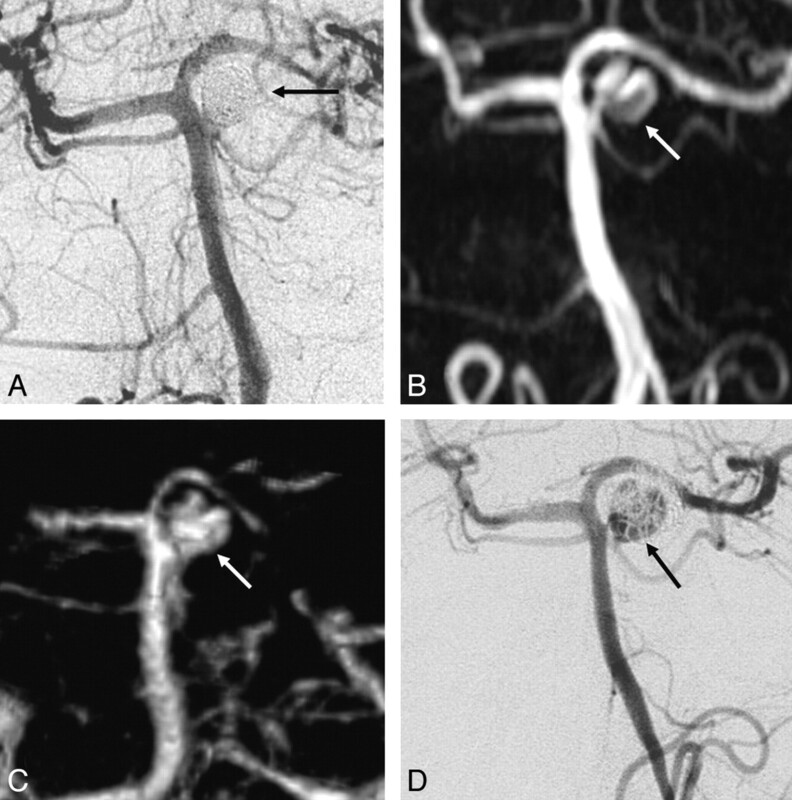 Disagreement between both TOF-MRA and CE-MRA with angiography on the occlusion of a carotid artery aneurysm. A, Angiogram obtained immediately after coiling shows a small neck remnant (arrow). B, Follow-up TOF-MRA at 6 months shows a small neck remnant (arrow). C, Follow-up CE-MRA at 6 months shows a small neck remnant (arrow). D, Follow-up angiogram at 6 months shows incomplete occlusion (arrow). Because the geometry of the reopened aneurysm was unfavorable, this patient was not retreated but was subjected to extended follow-up. Agreement between TOF-MRA, CE-MRA, and angiography on the occlusion of a partially thrombosed superior cerebellar artery aneurysm. A, Angiogram obtained immediately after coiling shows complete occlusion (arrow). B, Follow-up TOF-MRA at 6 months shows incomplete occlusion (arrow). C, Follow-up CE-MRA at 6 month shows incomplete occlusion (arrow). D, Follow-up angiogram at 6 month shows incomplete occlusion (arrow). The aneurysm was additionally coiled without complications, and complete occlusion was achieved. Correlation between CE-MRA and angiography for the 3-tier classification was moderate (κ = 0.52; 95% CI, 0.35–0.69), with full agreement in 44 (64%) of 69 aneurysms. For the 2-tier classification, correlation between CE-MRA and angiography was good (κ = 0.74; 95% CI, 0.52–0.96), with full agreement in 64 (93%) of 69 aneurysms (Table 3). CE-MRA wrongly classified 3 of the 12 incompletely occluded aneurysms as adequately occluded. These were the same 3 aneurysms that were not correctly classified as incompletely occluded with TOF-MRA (Figs 2⇑–4). All 5 incompletely occluded aneurysms that were additionally treated were correctly identified with CE-MRA as incompletely occluded (Fig 5). CE-MRA incorrectly classified 2 adequately occluded aneurysms as incompletely occluded: a ruptured 3-mm anterior communicating artery aneurysm and a ruptured 6-mm pericallosal artery aneurysm. The sensitivity of CE-MRA was 75% (95% CI, 43%–95%); the specificity was 97% (95% CI, 88%–100%). All test characteristics of CE-MRA and AUROC are displayed in Table 2. Intermodality agreement between TOF-MRA and CE-MRA for the 3-tier classification was good (κ = 0.71; 95% CI, 0.57–0.85), with full agreement in 54 (78%) of the 69 aneurysms (Table 4). Intermodality agreement between both MR imaging techniques for the 2-tier classification was very good (κ = 0.83; 95% CI, 0.65–1.00), with full agreement in 66 (96%) of the 69 aneurysms (Table 4). In the evaluation of aneurysm-occlusion status 6 months after coiling, diagnostic performance of TOF-MRA equaled that of CE-MRA. Interobserver agreement of both MRA techniques was good. Also correlation with angiography as a reference standard was similar and good for both techniques. The negative predictive values for incomplete occlusion at 6-month follow-up of coiled aneurysms were exactly the same for TOF-MRA and CE-MRA. This implies that contrast enhancement does not have additional value in excluding incomplete occlusion if the TOF-MRA shows an adequate occlusion. The positive predictive value of CE-MRA was somewhat lower than that of TOF-MRA. Thus, in our study group, contrast enhancement had no additional value for ruling in incomplete aneurysms either. Despite favorable test characteristics, 3 of 12 incompletely occluded aneurysms were wrongly classified as adequately occluded. Both TOF-MRA and CE-MRA failed to identify the same 3 incompletely occluded aneurysms. However, in none of these 3 aneurysms was additional treatment judged to be indicated, and the incorrect classification thus had no clinical consequences. The assessment of the occlusion status was to some extent limited by the use of a classification that allowed room for subjective differences. Apparently, it was sometimes difficult to classify a small residual lumen as borderline adequate or borderline incomplete occlusion.25 All 5 incompletely occluded aneurysms that were additionally treated were correctly identified with both MRA techniques. Another 3 adequately occluded aneurysms were wrongly classified as incompletely occluded, 1 with TOF-MRA and 2 with CE-MRA. This discrepancy implies that classification of incomplete aneurysm occlusion with MRA should be verified with angiography. Interobserver and intermodality agreements were substantially better in the 2-tier scales in concordance with a study on aneurysm assessment scales.24 Apparently, in the 2-tier scale, it was sometimes difficult to differentiate a completely occluded aneurysm and a small neck remnant. Although the 2-tier scales may not identify these subgroups, this outcome has little clinical impact because additional treatment is considered only in incompletely occluded aneurysms. A limitation of our study is the small sample size of 69 aneurysms, of which 12 (17%) were incompletely occluded, which precludes definitive conclusions on whether MRA can replace catheter angiography in the follow-up of coiled aneurysms. However, all patients underwent both TOF-MRA and CE-MRA, resulting in 138 MRA datasets for comparison with angiography, which was sufficient to draw conclusions about the additional value of contrast enhancement in MRA. Although in several previous studies CE-MRA was considered superior to TOF-MRA, this could not be confirmed in our study. Our TOF-MRA technique was optimized by using a short TE and the MOTSA technique instead of the single-volume 3D-TOF sequence that was used by others.10 In the MOTSA sequence, we used a section thickness of 1 mm, which might seem large for modern scanner technology. However, complete coverage within an acceptable timeframe with a good signal intensity–to-noise ratio limits minimum section thickness. To enhance the signal intensity–to-noise ratio, we used the overlapping slab technique. Halving the section thickness from 1 to 0.5 mm while maintaining the signal intensity–to-noise ratio would require a 4-fold increase in acquisition time. Because the parameters we used resulted in a relatively long acquisition time of 7 minutes, a substantially longer acquisition time was not considered an option. In summary, in this study, TOF-MRA and CE-MRA at 3T were equivalent in evaluating the occlusion status of coiled intracranial aneurysms. Because TOF-MRA does not involve contrast administration, this method is preferred over CE-MRA in most patients if MRA is used instead of catheter angiography for the follow-up of coiled intracranial aneurysms. Accepted after revision April 22, 2009. 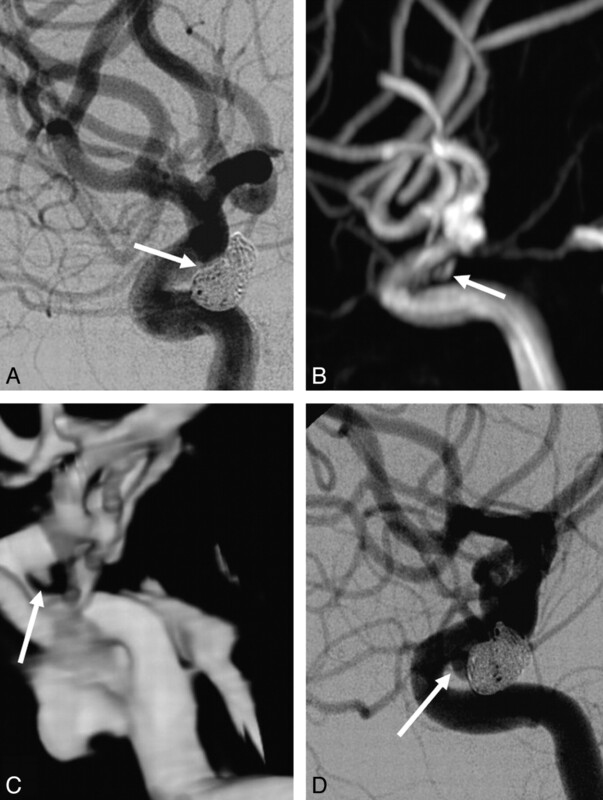 You are going to email the following Evaluation of the Occlusion Status of Coiled Intracranial Aneurysms with MR Angiography at 3T: Is Contrast Enhancement Necessary?